Something else I’ve discovered in my “hey let’s take a pause on churning out granny squares from now until the end of time” crafting phase, is that, hey, you know what? Most knitting projects have noticeable parts to them. Not everything needs to have an endless repetition of the same crafting process over and over again – it’s AMAZING. If I’m doing full disclosure, I’ll admit that I did take a few of those granny squares out so I could do a few borders, but that was a week ago so it may have just been a fleeting thing. But what I really mean to say is, this week I got to one of those places on not just one project but two. I finished the second sleeve on my spring sweater in progress, and now have a body and two sleeves waiting to be joined up at the yoke. There’s a small matter of doing some more pattern math and notes in there, but we’re focussing on the completion of discrete steps, so this is all awesome. I also started a new pair of socks, pulling out an oldie-but-goodie pattern of mine from my very early designing days, my So Simple Silk Garden socks. I’m going to give these guys a pattern refresh, since this one is now eight years old and that’s practically a million years in internet world. So, a new sample ahoy! But instead of Silk Garden sock I’m using some stashed Miss Babs Yummy 3-ply sport, acquired a few years ago at a Rhinebeck booth (or it may actually have been a Sock Summit booth, full disclosure again). I’ve lost track of the name of this colour, but it just screams spring, so it was just perfect for a spontaneous middle of May cast on. Stashed yarn always comes to the rescue when it’s ready! I hope you have some great projects on the needles for the weekend ahead. Happy Friday! the full version … love the parts so far and the color. Are you sure that yarn isn’t Mrs. Crosby? 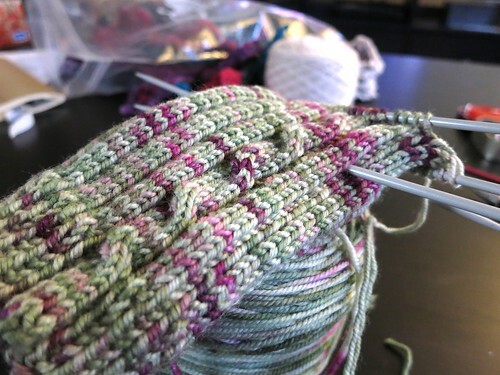 I am working on a pair of socks in the Bahama Woodstar colorway and it is so close to your photo. I saw the same colorway in a sport weight over the weekend as well and it looks pretty much the same. So I just cast on a pair of the So Simple Silk Garden socks out of Madelinetosh Twist Sock. I have knit this pattern several times and enjoyed it. I decided it was high time to learn how to cable without a needle. Thanks Glenna for a great little tutorial. Why do I resist change when it would make my life easier?